Thank you for taking a few minutes out your busy day to stop by and share with me my vision of the natural world. This space on the internet has changed over time since I started blogging back in 2006, but the overarching theme has been my passion for nature. I use digital cameras to help illustrate what I see, but I don't often go into details about the photographic process. This is something I want to start diving into occasionally, and I hope those of you that are interested in photography will find these types of posts engaging. If not, I hope you enjoy the images! Early this week I had the rare opportunity to have an evening free to explore a few acres in Williams County, Ohio. 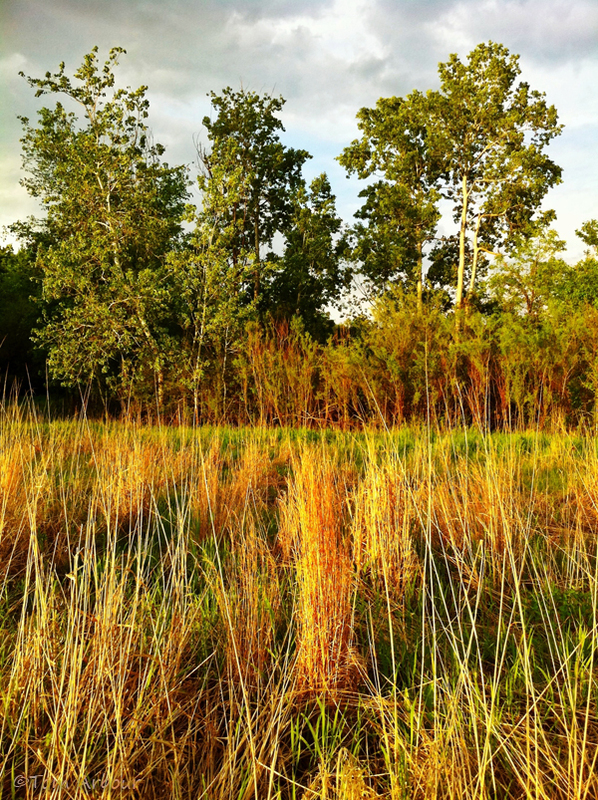 I meandered through area of grasslands and swamps looking for interesting photographic opportunities. A low cloud deck obscured the sun, resulting in rather washed out, uninteresting evening light. I tiptoed around the edge of a swamp searching for something of interest to photograph. 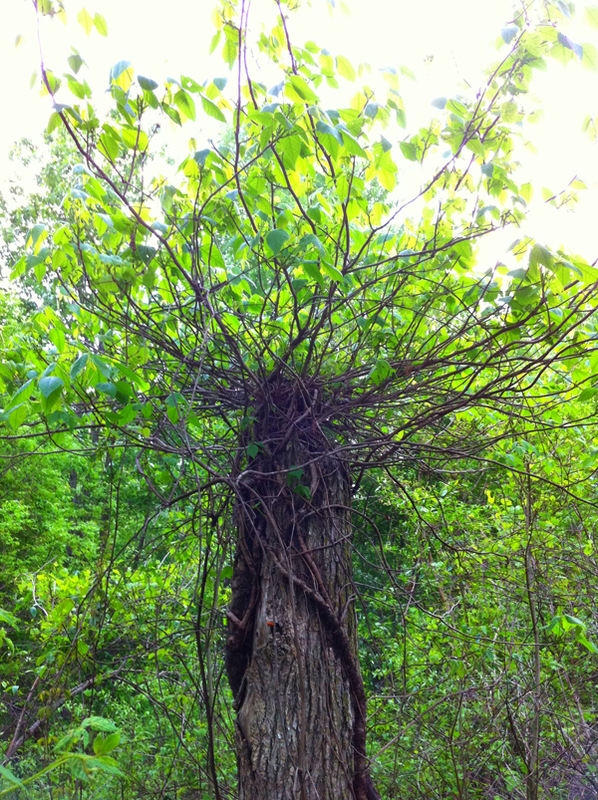 This dead stump, covered with living poison ivy vines, became my subject. An interesting story, but not really a compelling photograph. On my walk I did note a few white-barked quaking aspen, that if the clouds lifted, would make fantastic subjects bathed in the light of the "magic hour". As I waited for that light, I sat on a large glacial erratic boulder, watching a gray colorless sky. I looked at the rock and felt its ridges and furrows- it had engaging colors and patterns. I was lamenting that Ohio doesn't have any granite bedrock like that at Yosemite, whose shear cliffs the great Ansel Adams made famous. Then something clicked! 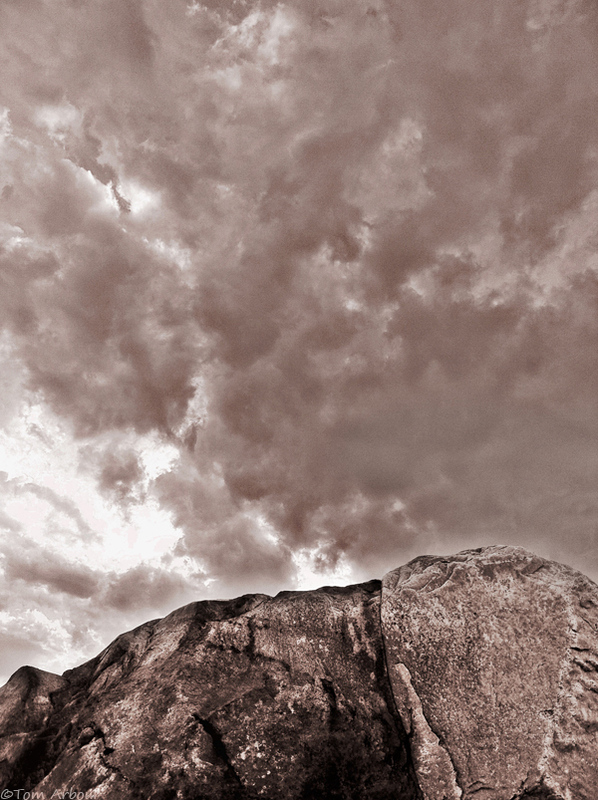 With the right perspective, I could use this giant boulder as my Ansel Adams Cliff. Since there wasn't much color in the scene, an Adams-esque high contrast black and white would be perfect. What do you think? Did I trick your eye into thinking you were looking at a tree-less mountain? Finally, the light that I had visualized earlier did come- the sun dropped below the cloud deck, pouring golden light over everything. What I hadn't anticipated was how cool the dead stems of last year's prairie grasses would look against the new spring greenery. I was pretty happy with this image- it was the one I was waiting for, and I almost went inside at this point. The mosquitoes had enough of my blood already. But I am glad I stayed put. As the first cloud deck moved across the landscape, another quickly replaced it- but these clouds did not obscure the sun. Just as the sun was at the horizon, these clouds started to catch "fire", and by this time, I was really excited- I don't often get sunset images like this, but I absolutely love this phenomenon. Galen Rowell, an incredible photographer and mountaineer, loved photographing these types of moments. So there you have it- an hour long peek into my photographic brain. Although I missed my family dearly, an overnight work trip allowed me to photograph the sunset. If I have to be away, hopefully I can bring home images like these every time I am gone. 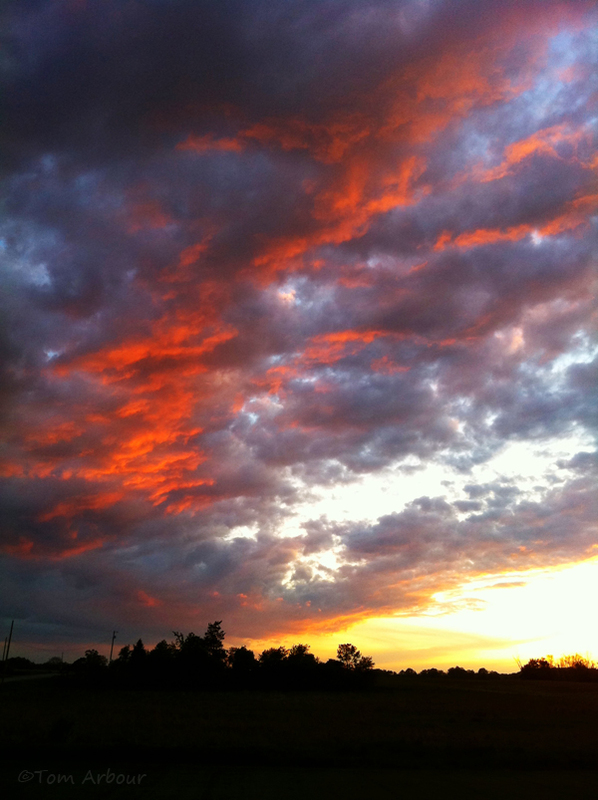 Nice post Tom, most people give up on sunsets too early. Your post makes be recall last fall when I was in Big Bend N.P. I was waiting for a sunset with another couple it was an ok sunset and they left. They had only been gone a few minutes with the sky lit up like your shot above. Great images, Tom. The glacial erratic certainly was a nice trompe l'oeil. On another matter: I check out each of your posts pretty religiously, but you seem kind of aloof. You rarely (ever?) reply to your commenters' remarks. It would sort of be nice to have some feedback from you once in a while. But, hey, it's your blog, I know you're really busy with work and family, and no one's forcing me to read the blog. Just my thoughts, for what they're worth. @ Anonymous- Really? You must not have been reading my blog for very long. I used to reply to every comment- I would get dozens of comments for some of my posts. Part of the reason I thanked the readers at the beginning of the posts is that I am no longer able to respond to everyone's feedback at blogger. Between comments here, at Facebook and Twitter, responding to them all is no longer a priority for me, unless someone has a question. I've also stopped doing posts that are interactive- I used to to a "collective naturalizing" series where I'd have great discussion about the ID of plants and animals with the readers. Things have changed- I do read each and every comment- I receive them all via e-mail. Thanks for your reply, Tom. I started reading a few months before Weston was born, and I'll keep doing so. You're an exceptional photographer and I like to see images and natural history notes from my home state, though I don't live in Ohio any longer. Great shots and your text is appreciated. As I try to be a better photographer I concentrate too much on the technical process and not enough on the creative process. Your text in this blog posting inspires me to refocus. BTW - I enjoyed meeting you and seeing your work at Flora-Quest. I did enjoy these shots.